Do you have a birthday tradition? I have a birthday tradition of making my own cake instead of buying one. The day before we bake the cake and the next day we bring the cake to the party. The night before the party we make and decorate the cake. First, we buy decorations, cake mix, and icing. Second, we mix and bake the cake. 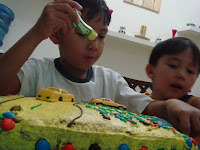 Finally, we decorate the cake. We put the icing, M&Ms, Oreos, toys, and candles on the cake. Sometimes we have a theme, like cars, baseball, or aliens. The next day we bring the cake to the party. We have to be careful to protect the cake. We wrap it with foil. We put toothpicks under the foil so the cake’s design will not be destroyed. Also when we are driving we have to be careful. Usually my mom holds my cake in the car. When we get to the party we sing “Happy Birthday.” After we sing “Happy Birthday” we eat the cake. I like to make my birthday cake because it is fun and we can choose the themes that stores would not have. If it were my birthday, I would have a Star Wars cake. I would put black and yellow icing, and sprinkle a little sugar powder on the cake. I would use the black icing to make space and I would use the yellow to write “Star Wars.” I would use the sugar powder to make a hundred thousand stars. I think it would look great. I think you should try to make a cake instead of buying one.